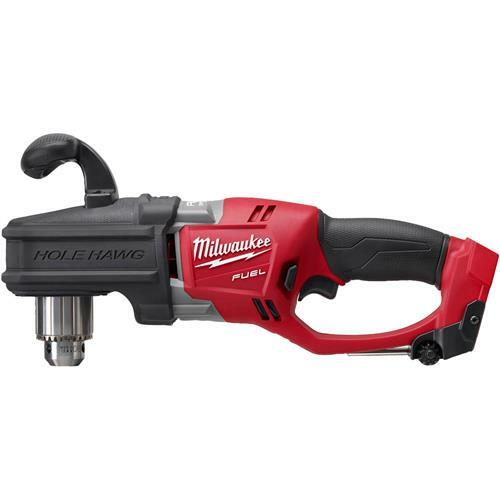 The M18 FUEL™ HOLE HAWG® 1/2" Right Angle Drill from Milwaukee drills faster than the original corded HOLE HAWG®, delivers over 150 7/8™ holes per charge, and is over 30% lighter weight than its corded predecessor. Optimized for electricians, the M18 FUEL™ HOLE HAWG® is the first cordless tool of its kind, delivering game-changing productivity for professionals drilling with augers up to 1-1/4" and self-feed bits up to 2".The POWERSTATE® brushless motor delivers better performance than corded drills, especially under heavy load. 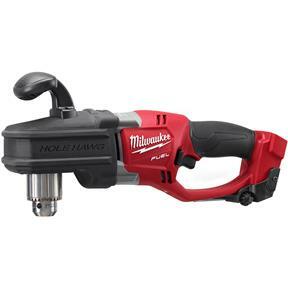 REDLINK PLUS™ Intelligence is the most advanced electronic system on the market, preventing damage to the tool and battery caused by overloading or overheating. The REDLITHIUM™ XC5.0 batteries provide up to 2.5X more run time and recharges than standard lithium, operate down to 0deg;F/-18deg;C. and have a battery fuel gauge to display the remaining charge. 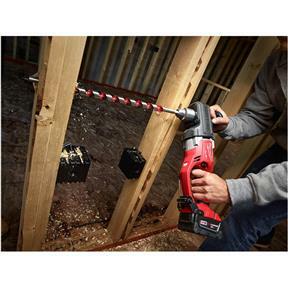 Capacity in wood: auger bits up to 1-1/4" and self-feed bits up to 2"